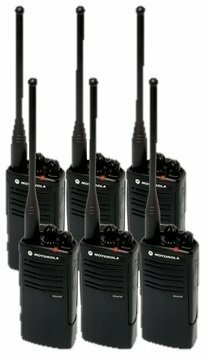 6 Pack of Motorola RDU4100 two-way radios. Each of our radios comes complete with factory default programming, a single-unit charger, 18.5 hour lithium ion battery, belt clip. 6 Pack of Radios and associated accessories. 4 watt covers up to 30 floors, 350,000 square feet range (typically 2-3 miles) depending on terrain & conditions. Comes with factory default narrowband RDU4100 10 channel programming. Set to UHF frequencies so works well both inside and outside . Each of our radios comes complete with a single-unit charger, 18.5 hour Lithium ion battery and belt clip. This radio has the best possible range and battery life for any Motorola radio we carry. Super high quality and loved by customers .